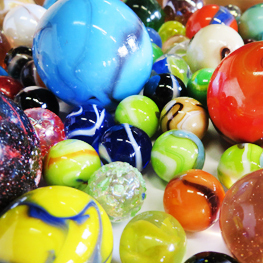 The Moon Marble Company is open Monday through Saturday 10 am - 5 pm. We will be demonstrating marble making on Tuesday, Friday, and Saturday this week .....Come visit us! Demos begin at approximately 10:30 am, shut down at approximately 3:00 pm. We may run over or finish up a bit early. 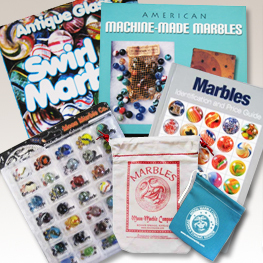 Marble making is a variable process, so please allow some flexibility. 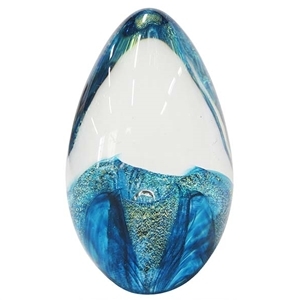 Glass Eye Studio Egg Weight - "Aqua Blue Passion Flower"
Find your Marbles at the Moon! 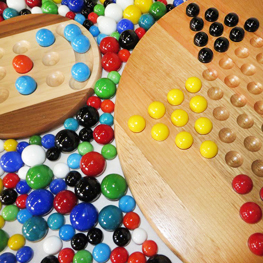 We have made wooden toys and game boards for many years, but always had difficulty finding varieties of marbles for our product. 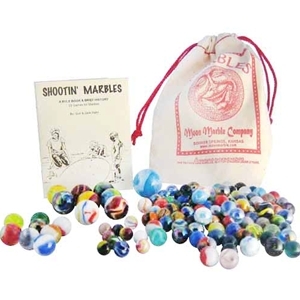 We wanted marbles that we had as children like Bumble-Bees, Cubscouts, Puries, and so on. In 1997 this "need" led us to the opening of the Moon Marble Company store. 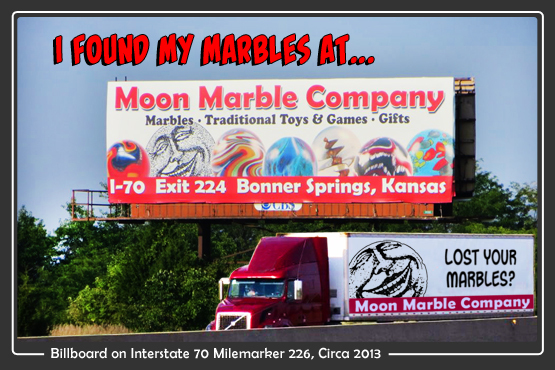 The store is located near the intersection of K-32 & Hwy 7 in Bonner Springs, KS. 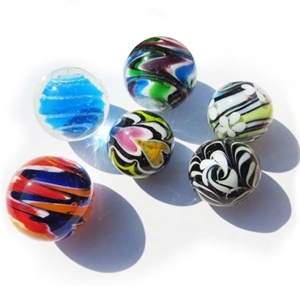 We stock machine made marbles in a multitude of colors and designs in sizes from pee-wees to 50mm. 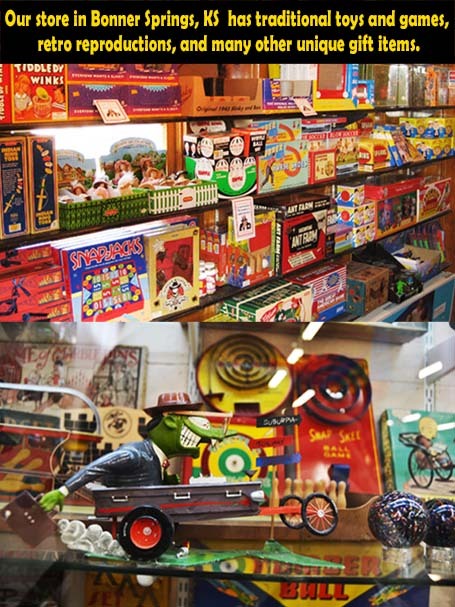 In addition, we carry traditional toys & games as well as gift items for all ages. Artisan and owner Bruce Breslow frequently demonstrates his marble making. 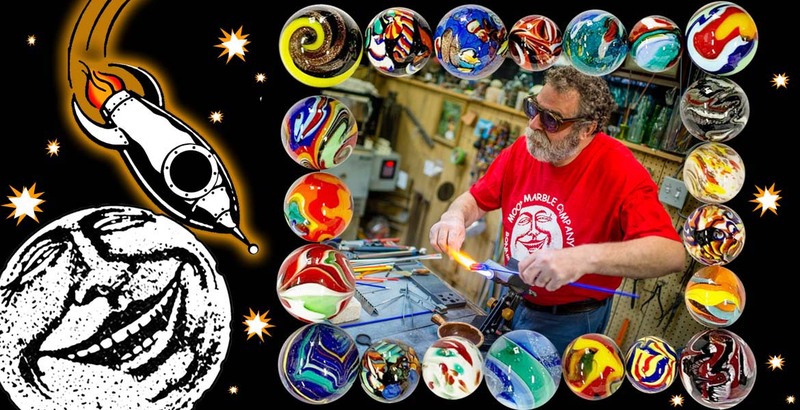 During demonstrations, Bruce will explain the process of glass working, marble history, and other fascinating areas of marble interest. 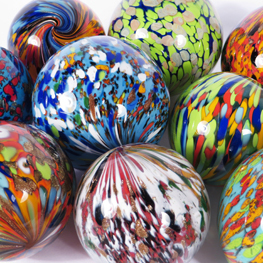 We also exhibit and sell the work of several dozen prominent glassworkers from across the country. 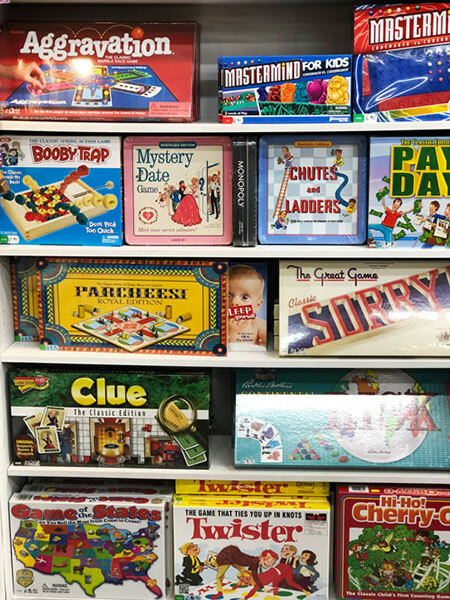 Visitors to the store will enjoy perusing the displays of antique marble toys or maybe "knuckling down", if the remember how!! 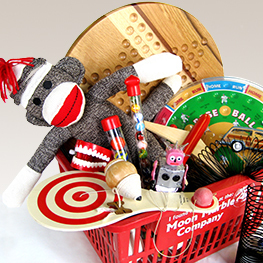 Shoppers are sure to find something special for everyone on their list among our selection of special and unusual items. 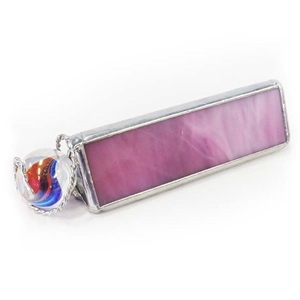 We have created MoonMarble.com for those of you not fortunate enough to visit us in person. So browse, enjoy, shop if you'd like to, and thanks for visiting.